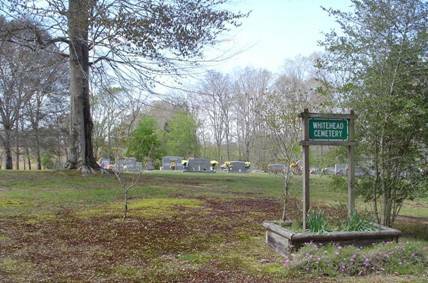 To reach the Whitehead cemetery, from the Courthouse Square in Waynesboro, travel highway 64 east for 1.2 miles. Turn left onto highway 99 and go 2.5 miles to the Wayne County Memory Gardens. Continue on highway 99 by turning left at Memory Gardens and travel 4 miles. Turn left again at the Topsy Fire Station onto Topsy Road and go 2.6 miles and turn left at the Topsy Store onto Topsy Store Road. Go .6 miles and turn right onto Whitehead Cemetery Road (a dirt road) and go .2 miles to the cemetery. This cemetery only has one or two unknown graves. The cemetery is very well kept and has room for many more graves. Sealy, Bettye A.; b. 04 Apr 1943, d. 15 Apr 2012, wife of Charles W.